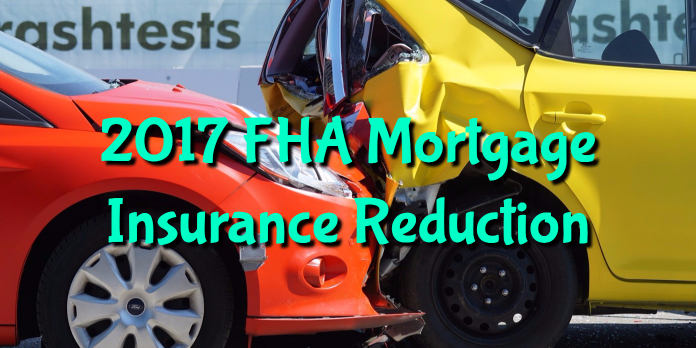 In an announcement that was made on Monday January 9th, the FHA too another aggressive step by introducing the 2017 FHA Mortgage Insurance Reduction of 0.25%. This will bring the FHA Mortgage Insurance Premium from 0.85% to 0.60% and it also reflects the second such decrease in as many years. This is a sign that foreclosures on homes is still decreasing and there is ample reserves in FHA premiums which can cover foreclosures when they do occur. Prior to the 2017 FHA Mortgage Insurance Reduction and the 2016 reduction, the FHA Mortgage Insurance Premium was 1.35%. With the reduction from 0.85% to 0.60% you would see the following savings in insurance premium: On a $200,000 loan, the FHA MIP would be reduced from $1,700 to $1,200 for a savings of $500 or a little over $40 per month. This is a significant amount of money you can save if you are currently in an FHA Loan. If I got ahead of myself here, the FHA MIP is seen as an up-front 1.75% of the loan value at closing PLUS the additional 0.60% calculated on an annual basis and paid monthly in your mortgage payment. – With the 2017 FHA Mortgage Insurance Reduction this was obviously in an effort by the current administration to create a spike in home sales after the surge in interest rates had definitely cooled down the housing market drastically in the 2 months since the Presidential Election. – The one caveat with these rate reductions is they aren’t permanent and can be easily retracted by the President-Elect who can raise the FHA MIP immediately. – Under normal circumstances the Republican party is normally against FHA Mortgage Insurance Premium reductions as they view the public is at risk should there be another meltdown and the FHA runs out of money for foreclosures and defaults. – Upon release of the plan for the 2017 FHA Mortgage Insurance Reduction, private mortgage insurance companies that are publicly traded saw their values drop up to 5%. 2017 FHA Mortgage Insurance Reduction: What Now? The one thing you can do now to take advantage of the 2017 FHA Mortgage Insurance Reduction is get in contact with us to refinance your current FHA Loan immediately. As long as your net tangible benefit of the refinance is 5%, you can apply for a refinance today. If you would like to get an FHA Loan for a home purchase or refinance an existing loan, please reach out immediately at 888-900-1020 or contact@loanconsultants.org. We are here to help and get you the best loan possible.